We are Leading Supplier of Chain Conveyor. Owing to well-equipped infrastructural setup, we are offering a precision-engineered assortment of Chain Conveyors. Our offered product is designed at state-of-art production unit. We provide our clients with a comprehensive range of Heavy Chain Conveyors, manufactured using quality raw material and cutting-edge technology. These heavy chain conveyors can be customized as per the specifications laid down by our clients. Low power consumption, durability, rugged construction, corrosion resistance and long service life are some of the features that our range boasts of. Owing to the vast acquaintance, our firm is competent to present Flat Top Chain Conveyor. Our customers can avail this product as per their requirements. We are most popular name in the market engaged in tendering world class array of Chain Conveyor in many sizes. Being a well-distinguished company in the market, we are into offering Overhead Chain Conveyor. 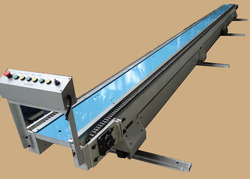 We offer high quality Chain Conveyors according to customer needs. Available in different shapes and sizes, these Chain Conveyors are used for conveying for abrasive and hot material at reasonable rates. We are one of the leading names in the field of manufacturing and trading Conveyor Scraper all over the world. Innovation is our forte and we are providing high quality of Chain Conveyor to the prestigious consumers, in several specifications. 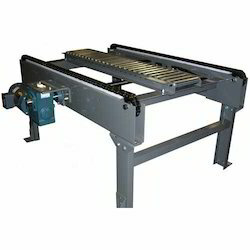 Slat conveyors are conveyors which have steel slats. Slats can be of different thickness depending upon the job weight. Slats are placed very close to each other so that the job moves easily on the conveyor. Even fixtures can be welded to slats to carry different types of jobs on them. Chain conveyor is used for moving empty and filled cylinders from one location in the plant to another location, passing through various processing points. This facilitates cylinder movement and automation in production. We offer a wide variety of Chain Conveyor that are manufactured from top grade materials as per industrial standards. These are available in various specifications and models. Widely used in various industrial establishments, these conveyors are available at most competitive prices thus making them a good choice for our clients.